The hidden lives of hens: this amazing video follows a group of hens who were rescued from a standard practice egg farm after the farmer had a change of heart. Following their 2-3 years confined in battery cages, hens’ bodies cannot cope with the physical burden and can no longer produce eggs at a profitable rate. This is the point at which the entire coop will be killed, despite their natural life span being 8 years or more. During their short and tragic lives on a standard egg farm, what hens experience is far beyond heartless and nothing short of torture. These marvelous animals deserve our protection and respect but instead are subjected to our callous and cruel dictatorship. By choosing not to consume eggs, you can be sure less chickens will endure this lifetime of suffering, followed by an untimely death. In order to help more animals escape a fate of misery, try to be vegan for 22 days! We highly recommend to join Challenge 22+ for both free guidance and support. Edgar’s Mission is a nonprofit farm animal sanctuary with a vision for a kind and just world for all beings. The sanctuary provides homes for more than 450 rescued animals at their location in Lancefield, Victoria, approximately 60km north of Melbourne, Australia. Edgar's Mission encourages people to expand their circle of compassion to include all living beings through education, advocacy and community outreach. Male baby chicks cannot lay eggs, so what happens to them? This following video will leave you speechless! Watch the before and after story of hens who came from the egg industry. Finally they can act normal and do what is natural to them! 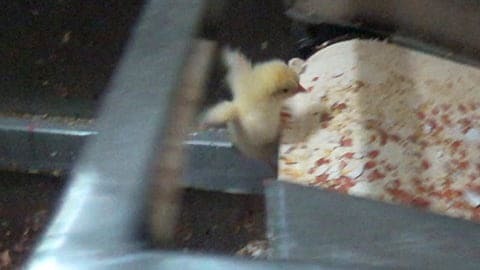 A shocking video that captures the horrors that baby chicks endure during their first day of life - THROUGH THEIR EYES. Watch the findings of a thorough investigation into hatcheries that breed chicks for both eggs and meat. 'Debeaking' (also known as 'beak trimming') is a standard practice in the egg industry. This shocking video shows what it's like to be the victim of this vile act. Erin Janus explains how the egg industry works from start to finish. This important video contains information everyone should know. After more than 18 months inside an industrial egg farm, this lucky hen gets to walk on grass! A must-watch until the end. Since male chicks can't lay eggs, they are disposed of in the most violent ways. This video shows a common method for killing chicks in India. Like other hens, Ava was about to be killed after 3 horrible years inside a tiny cage. Then, a miracle happened! Ever wondered where eggs come from? This sad video shows the unbearable lives of hens in the Netherlands and Belgium. Newly born male chicks are suffocated because they can't lay eggs. For the egg industry, male chicks are just garbage. This eye opening video shows the price that hens pay because of our love of eggs. This undercover footage exposes the hatchery that breeds more than 50% of the hens used by egg farms in Sweden. Your donation promotes compassion for animals and inspires people to make kinder choices. For a one time donation, click here. Kinder World is a non-profit initiative that is working hard to help farmed animals. Kinder World is a non-profit initiative that is working hard to help farmed animals. If you believe in our work, please make a donation in order to help us grow.